Using the Metadata Browser, you can compare sets of metadata. The metadata can be current data from a server, or a downloaded metadata file on your computer. Two views are available for comparing metadata:” metadata tree” and “overview”. The metadata tree view displays a side-by-side comparison of all metadata elements; color differences indicate changed values. The overview displays only the differences between the metadata sets. 1. From the View menu, select Metadata Browser to open the Metadata Browser. 2. Click MD Comparison in the Metadata Browser navigation pane. 3. Click the Add button (+) above the left navigation pane to open the Add File dialog box. 4. You can type a new name for the comparison in the Comparison name text box, if desired. • To add metadata from a server, click the Add Server Metadata button and select a server from the dialog box. • To add a downloaded metadata file, click the Add Stored Metadata button and use the dialog box to locate and select the file. 6. To change the order in which the metadata is displayed, click a metadata set to select it, and use the Move Up and Move Down buttons to change its position in the list. 7. Click OK. 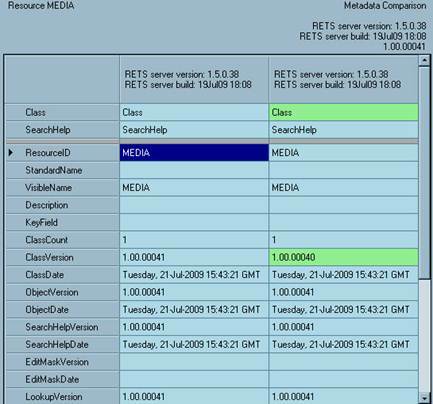 Depending on the number of files being compared, RETS Connector may take some time to download, process and compare the metadata. 8. Click the expand icon [ + ] next to the Comparison element in the Metadata Browser navigation pane. • To select the metadata overview, click Overview under the Comparison element in the Metadata Browser navigation pane. • To select the metadata tree view, browse the System subtree in the navigation pane of the Metadata Browser; clicking an element displays a comparison in the display pane. 1. In the Metadata Browser, while viewing a comparison overview, click the Print button.